I don’t know why my friend calls herself “The not so creative cook” because I love visiting her blog and I find her recipes and anecdotes quite inspiring. Anyway, at the beginning of this week, I bought this huge package of ground (mince) beef and I wasn’t planning to freeze it. So this week’s menu was “ground beef, ground beef and some more ground beef” First I made the rice in the previous post. Then I made spaghetti bolognese, then these Cheese and Pepper Stuffed Burgers. Yesterday as I was visiting my “not so creative friend”, I saw this recipe and I was sold. I made it with minor adjustments, for dinner. We had a half cup left over and my son had it for breakfast, with rice, this morning. Thank you so much Jhuls for this wonderful recipe. 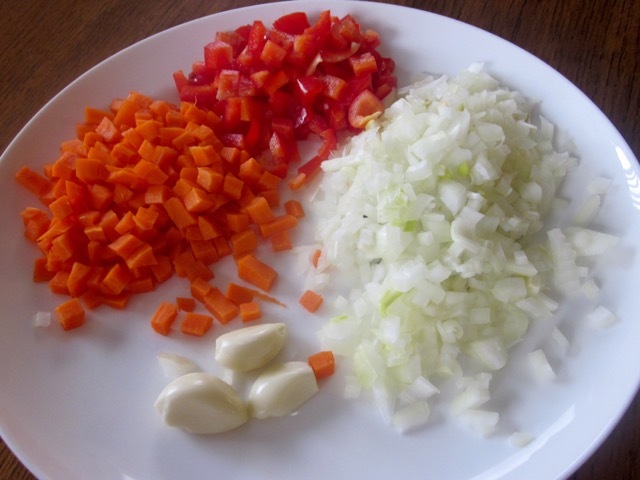 I quickly chopped ingredients and started cooking…. 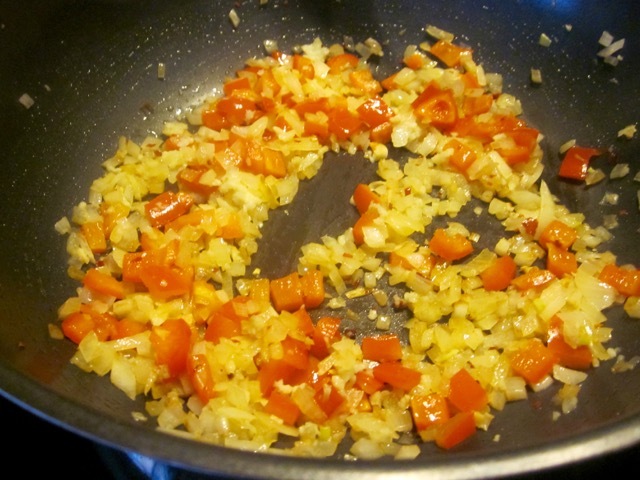 and cook until onion is translucent (about 5 mins). and stir fry over high heat until no longer pink and slightly browned. Add the rice vinegar (or dry sherry), oyster sauce, soy sauce, sesame oil and cook for about a minute. Add the broth (stock), bring to the boil, reduce heat and simmer 10 minutes. Adjust seasoning. then add the cornstarch slurry, while stirring constantly. 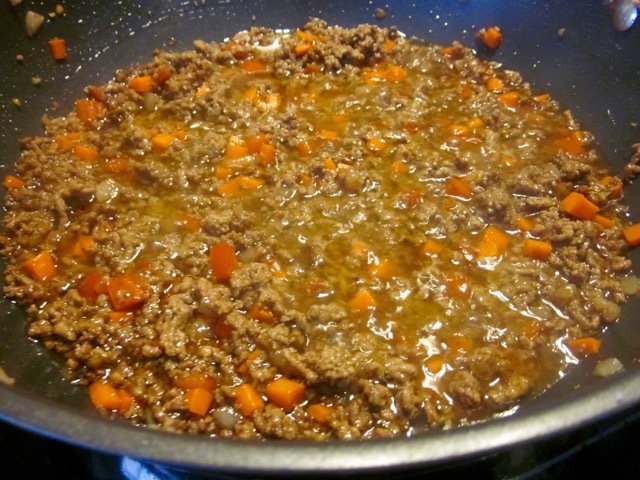 Cook until the sauce has thickened or has reached your desired consistency. 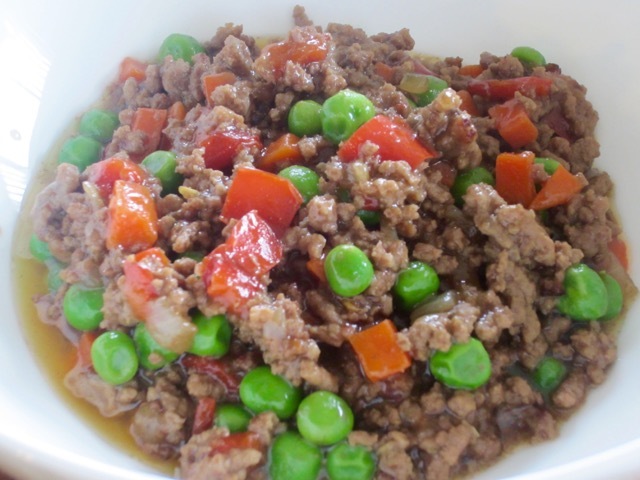 Serve with steamed basmati rice or pasta of your choice. Heat the olive oil over medium high heat in a wok or heavy based skillet. 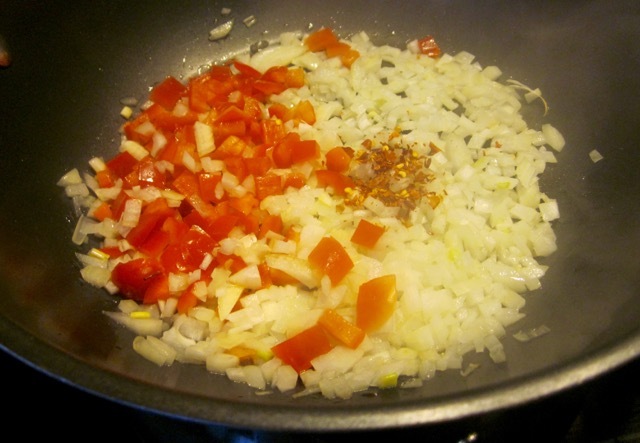 Add the onion, garlic, bell pepper and chilli flakes and cook until onion is translucent (about 5 mins). 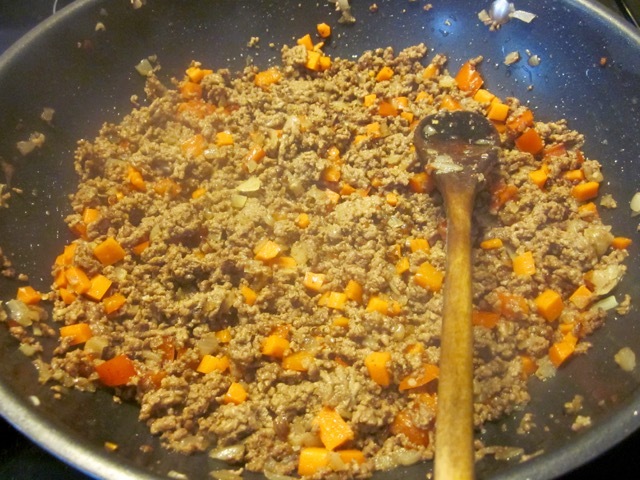 Add the ground beef and carrots and stir fry over high heat until no longer pink and slightly browned. 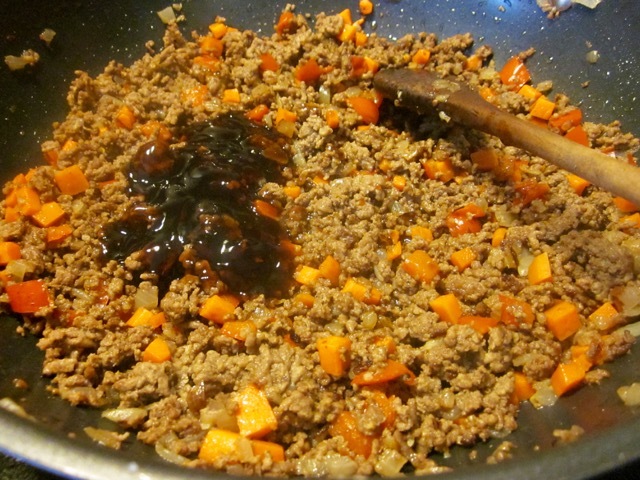 Add the rice vinegar (or dry sherry), oyster sauce, soy sauce, sesame oil and sugar, and cook for about a minute. 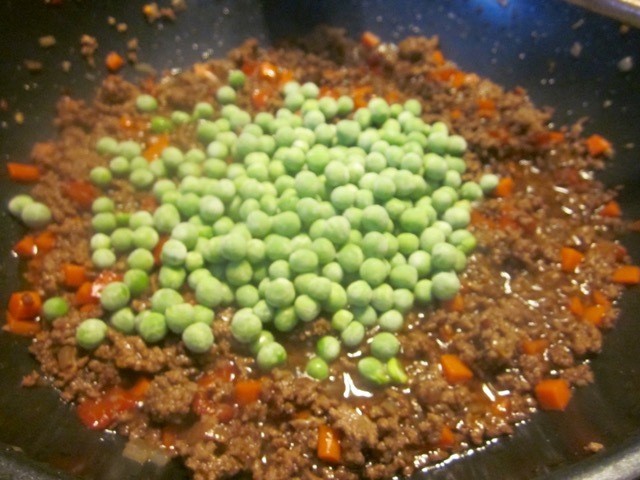 Add the green peas and cook for about a minute, then add the cornstarch slurry, while stirring constantly. 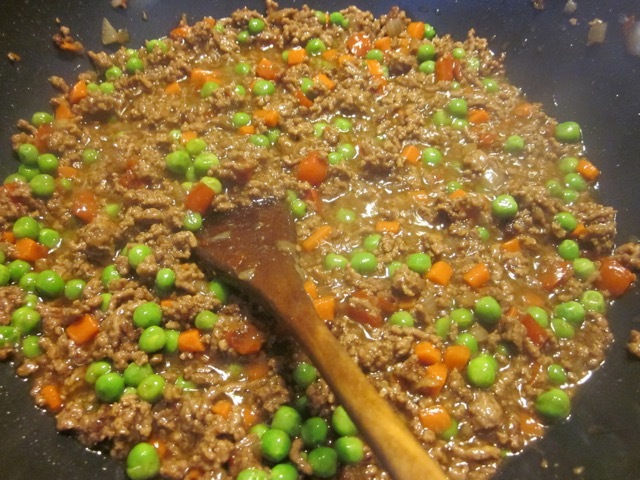 Cook until the sauce has thickened or has reached your desired consistency. My boys would certainly love this too! Hey how have you been? My life is so busy right now but you are always in my thoughts. I am planning to make a special trip to your blog. I pop in and out from time to time. Best regards to all the boys. I saw the ultimate croquembouche on your blog. Nice. I always wished I could make one, but have never had the courage to try. Take care Gal! Busy here as always. I’ve come to accept that it will always be crazy until they move out! I know. I have accepted it too! Have a nice weekend! This is quite a colorful stir fry dish, I’m sure the flavor is delicious. Yes and very tasty too! Liz, I love love your version. I love that you added carrots and capsicum. Thanks for trying this out and I am very much happy that you liked it. Take care! it was really nice. My son really loved it. Have a wonderful weekend!!! Yum. 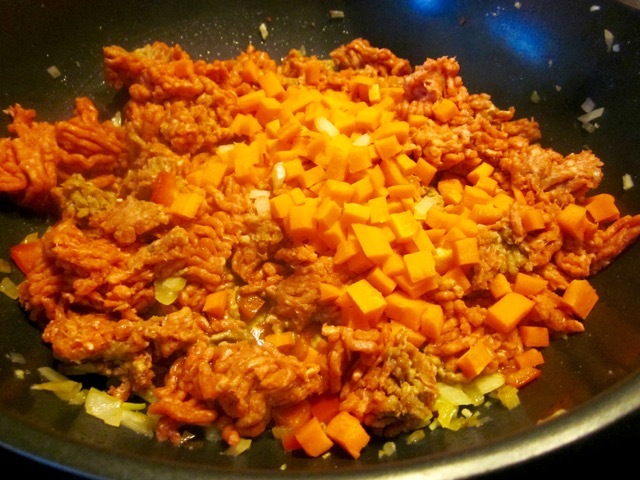 This is very close to a Filipino dish called giniling which includes potatoes. 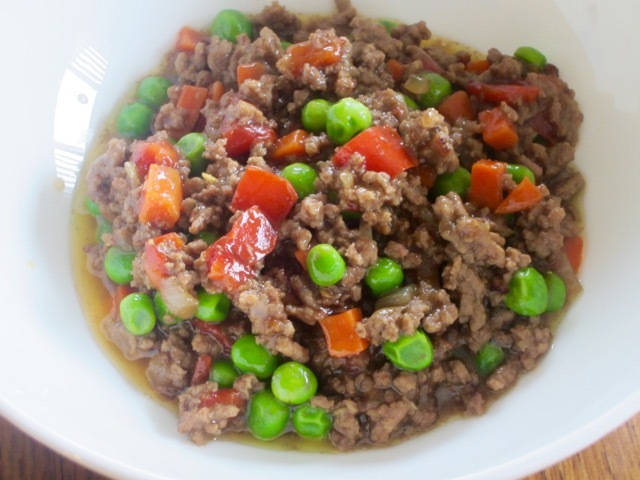 Alternatively, you can use ground pork and/or tomato paste, tomato sauce, and some raisins for another tasteful dish. I love the addition of potatoes, coz they’re a favourite ingredient of mine. Thanks for the compliment.